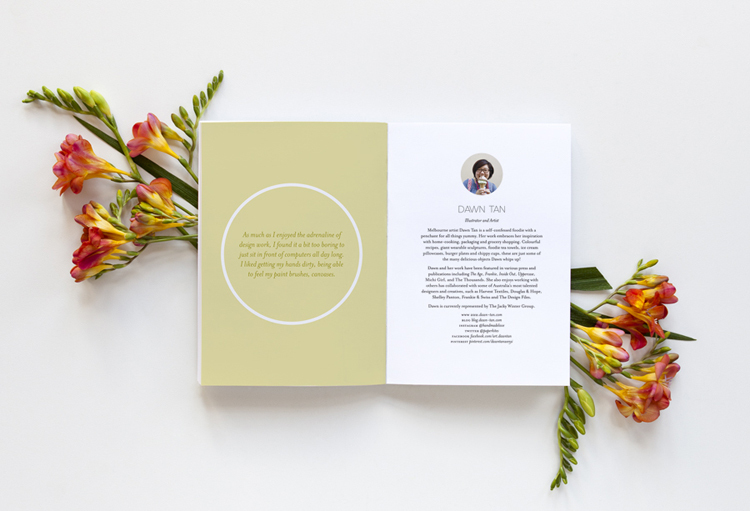 The inspiring new book ‘Conversations with Creative Women – Vol 2’ by Tess McCabe is launching this week, we caught up with the lovely lady to hear all about the book. We’re excited to let you know we will also be selling the book at the Brisbane Markets this weekend & at Sydney Markets also at the Follow Store pop-up stall. Tell us a bit about Conversations with Creative Women – Vol 2 and what we can expect to find? 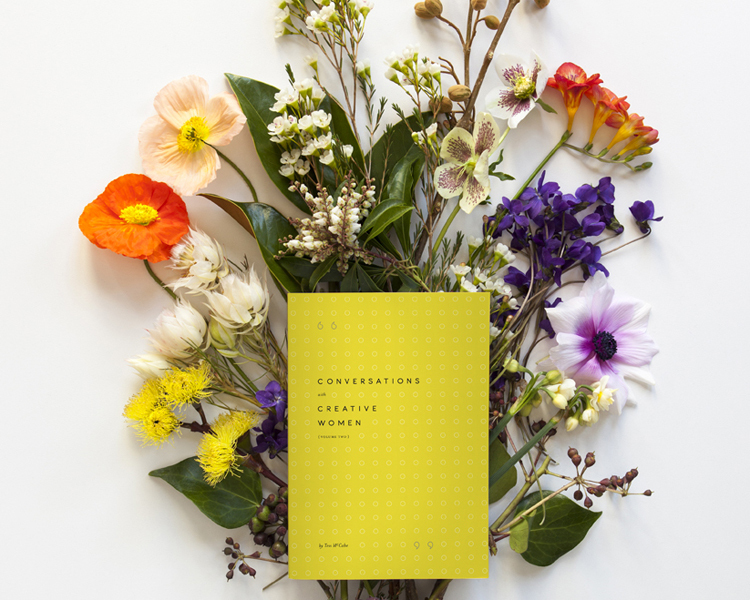 Conversations with Creative Women: Volume Two is a collection of interviews with 16 talented creative Australian women. In it, women from different creative industries and with different career stories talk about their work, the path that got them to where they are now, the challenges they faced and how they overcame them. They are all at different stages of their careers – some have larger businesses with staff, some are solo practitioners, some practice their art in and around full-time work or family commitments. Each has a different take on success and all have wisdom to share. 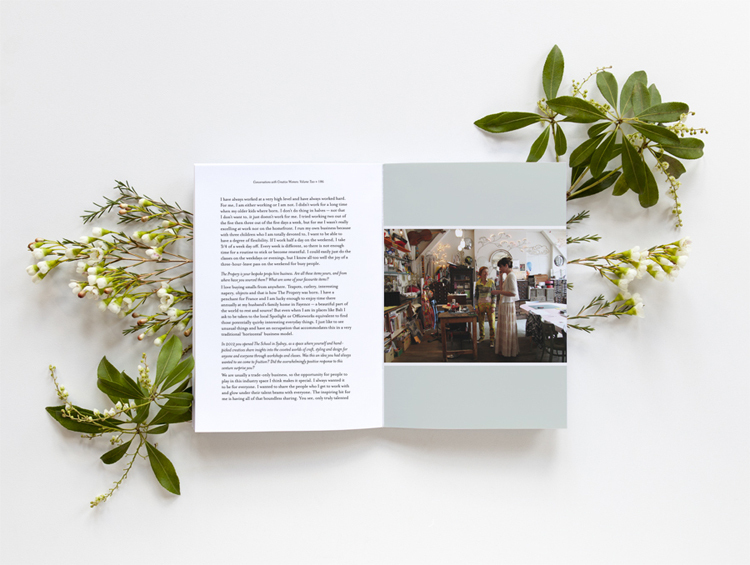 Stylist Megan Morton, Emily Wright of Nancybird, illustrator Dawn Tan, ceramicist Shelley Simpson of Mud Australia and maker Madeleine Sargent of Made by Mosey are amongst the women featured in the book. It can be purchased online from the CWC website, or at selected stockists nationally. You can also buy it at the upcoming Finders Keepers markets in Brisbane and Sydney! What was the inspiration behind sharing these stories? A couple of years ago I was at a bit of a fork in the road regarding my graphic design career: I didn’t feel particularly creatively fulfilled, I had side projects that I loved doing but they weren’t fruitful enough to live off, and I wanted to start a family! Working for myself also had its struggles. l loved hearing women speak at Creative Women’s Circle events, and at times I wished I had their advice in print so I could refer to it when needed. So I decided to ask women in different creative industries how they managed their careers, their creative hobbies, and their families and I compiled those interviews into a book. That was Conversations with Creative Women (released in 2011), and this year I had more questions for more ladies I admired, so I have released Volume Two. How has the creation of Volume 2 differed from the release of the first book, and what has the response been like? It’s been great to put together a companion piece to the first book. Mainly because there were just so many women I wanted to interview in the first, but couldn’t. In Volume Two, I’ve tried to include women working in industries that weren’t covered in the first book. 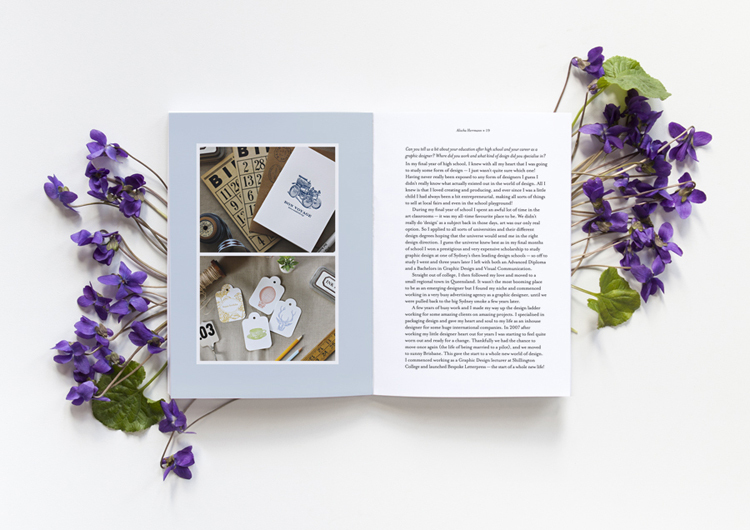 This time around, I had a lot of fun developing a pre-order campaign to help fund the printing, including a photo shoot and a fantastic collaboration with Frankie and Swiss, Emily Green, Catherine Campbell and Lara Cameron. The response was overwhelming, and I’m so, so excited for people to finally receive their books and read all the fantastic interviews. Tell us a bit about the Creative Women’s Circle and the concept behind it? CWC is a community for women working in creative industries and running their own businesses to share information, inspiration and ideas. We hold talks (in Melbourne and Sydney) with guest speakers who give a presentation on their career and creative life; we have small-group sessions where we discuss different issues relating to creative business; and occasionally we hold workshops, such as our ‘Copyright for Creatives’ workshop with Sharon Givoni earlier this year. We have a website with lots of interviews, business tips and inspiration; we have a searchable database of creative women in different fields; and we produce books, of course! CWC’s aim is to strengthen the community of independent business owners, inform and educate them to help them in their businesses, and shine a spotlight on intelligent, creative women and the fantastic work that they do. What are you working on now, and what can we expect to see from you and CWC in 2014? It feels a bit non-stop around here, I’ll admit! My aim for 2014 is to launch CWC events in other cities. It’s a big move (especially as it is pretty much just me behind it all), but I know there are other communities of creative women out there who would benefit from it. There is also another book in the works, which will be an essential resource for all creatives. You’ll have to keep an eye on our website for details on that one! For a list of local stockists head to the Creative Women’s Circle website, or you can buy online at Follow Store here.